The MARINCO On-Board Charger Inlet makes battery charging through an on-board battery charger safer and more convenient. The inlet mounts on the boat™s exterior and is hard wired directly to the charger. 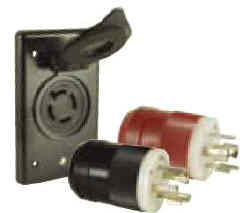 Just open the flip lid cover and plug an extension cord into the inlet to bring charging power to the boatâ€™s batteries. All of the hatches remain closed and locked throughout the charging cycle, adding convenience and security for the boater.